The Chicago Blackhawks used a sizzling start and a fantastic finish to capture the Presidents' Trophy for the first time in 22 years. Patrick Kane had a goal and two assists, and the Blackhawks clinched the NHL's best record on Wednesday night with a 4-1 victory over the Edmonton Oilers. The Blackhawks (35-6-5) held off the Eastern Conference-leading Pittsburgh Penguins for the top regular-season record in the NHL. Jonathan Toews, Patrick Sharp and Johnny Oduya also scored for the Blackhawks, who have gone 10-1-2 in their last 13 games and assured themselves of the NHL's best mark for the first time since 1991. 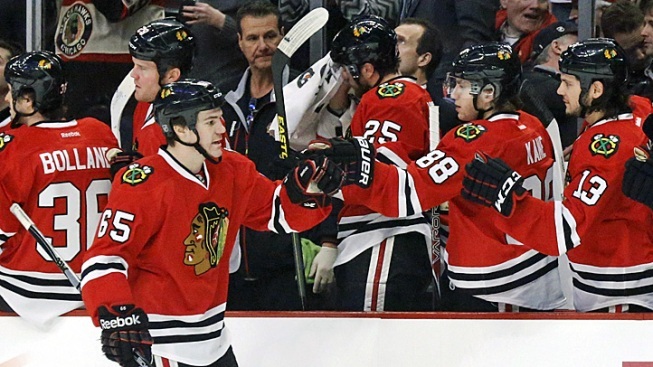 Chicago began the season with at least one point in each of its first 24 games. "To have the start to the season that we had and to keep playing consistently is an amazing thing for our team," Toews said. "We've shown a lot of character, we've definitely learned from our mistakes the last few years, and we've grown. I think everyone has matured as players in this locker room. "We have to use that experience and use that confidence from being the number one team all year and carry it into the playoffs." Blackhawks coach Joel Quenneville was happy to have the best regular-season record, but Chicago's goal is to win the Stanley Cup for the second time in four years. "The start of our year really put us in a great spot, but the consistency has been there, as well," Quenneville said. "I congratulate the guys, they deserve what they got. "Everybody had a hand in it, everybody contributed. It was a real, good team effort across the board. But I don't think we want to get too excited, we have some serious work to do still." Nail Yakupov scored for the Oilers (17-22-7), who lost for the ninth time in 10 games and are headed toward another high draft pick. "The individual errors are just killing us at the moment," Oilers coach Ralph Krueger said. "We need to be very cognizant about the importance of reacting to this. The results are less important than the way we are playing and executing right now. "We're being tested right now in the severest of ways with the losing month like this. We should all expect more from each other." The slide has taken its toll on the Oilers. "We need to be a group of professionals in here," Oilers goalie Devan Dubnyk said. "We need to understand that these games are valuable, regardless of who you are talking to or whose opinion it is. "The simple fact is that they are valuable for us. It's frustrating for every one of us in here. It's unacceptable." Chicago took a 1-0 lead 3:58 in when Toews elected to shoot on a 2-on-1 rush, cleanly beating Dubnyk with a wrist shot to the stick side for his 22nd goal. The Oilers tied it 52 seconds later when Yakupov gathered a rebound off the boards and fired a slap shot that goalie Ray Emery couldn't stop. It was the 12th goal for Yakupov, the No. 1 overall pick in the 2012 draft. The Blackhawks went ahead 2-1 at 8:11 of the first as Kane fought off Justin Schultz to go in on a breakaway. He put a shot between Dubnyk's legs with relative ease, tying Toews for the team lead with 22 goals. Corey Crawford came in to replace Emery with 6:11 left in the first after Emery sustained a lower body injury. Crawford kept his team in the lead with a beautiful glove save eight minutes into the second. Jordan Eberle waited for a sliding defenseman to go by before lifting the puck up high on the doorstep. The Blackhawks came close to adding to their lead with six minutes left in the second when a puck got through Dubnyk's legs during a scramble and sat on the goal line before being swept to safety by Schultz. Edmonton had only two shots in the second period. Chicago went ahead 3-1 at 4:36 of the third period when Oduya took a pass from Kane on the fly and picked the top corner with a quick wrist shot. The Blackhawks sealed it with an empty-net goal from Sharp. Despite his early exit, Emery was credited with the win. NOTES: It was the first time the Blackhawks played in Edmonton since Feb. 2, 2012, the night Sam Gagner had eight points to tie the Oilers' franchise record for most points in a game — matching Wayne Gretzky and Paul Coffey. ... The Oilers have 20 players on their active roster who are in the minus column. The Blackhawks have three. ... Patrick Sharp returned to the Chicago lineup after missing five games with an injured shoulder. Dave Bolland remained out with a groin injury. ... 2013 Hobey Baker Memorial Award winner Drew LeBlanc made his NHL debut for the Blackhawks after singing as a free agent with the team earlier in the month. ... Ryan Nugent-Hopkins (shoulder) and Ales Hemsky (foot) remained out for Edmonton. Magnus Paajarvi returned from a foot injury. ... With the Oilers eliminated from the playoff chase, Taylor Hall, Eberle and Dubnyk accepted invitations to play for Canada at the World Hockey Championship.